While the Synod of Dort continued its sittings, Prince Maurice and his party were actively employed in increasing the popular ferment against Barneveldt, Grotius and Hoogerbetz; in collecting evidence of the designs and practices of which they were accused, and in framing the legal proceedings against them in such a manner as was most likely both to procure their conviction, and to persuade the public of their guilt. We have mentioned that their confinement took place on the 20th of August 1618, and that they were removed from the Hague, the original place of their imprisonment, to the Castle of Louvestein. On the 19th November, the States General, at the instigation of Prince Maurice, nominated 26 commissioners for their trial. All the prisoners objected both to the jurisdiction of the commissioners, and to that of the States General; and asserted that the States of Holland were their only competent judges. They observed, at the same time, that many of the judges were notoriously prejudiced against the Arminians. The act of accusation contained many general charges, and many averments of particular facts, supposed to substantiate them. It was alleged against the prisoners, that they had disturbed the established religion of the United Provinces; that, in direct contradiction of the articles of union, they had asserted the right of each province to decide for itself in matters of religion; that they had set up the authority and interests of the States of Holland and West Friesland against those of the States General; that they were the authors of the Insurrection at Utrecht; had levied, in opposition to the orders of government, the attendant soldiers; had raised jealousies between the Prince and several of the Provincial States, and between these and the States General; and that, by their habitual conduct, they had become public disturbers of the tranquillity of the republic, and councillors and practisers of schemes hostile to its welfare. The Commissioners proceeded to the trial of Barneveldt. Uniformly protesting against the competency of the tribunal, Barneveldt defended himself with great firmness and ability. He controverted every article of the accusation, and concluded his defence, by a long and pathetic enumeration of the services, which he had rendered to the republic; and of the numerous actions, by which he had shewn his attachment to Prince William and Prince Maurice: - he proved that it had been principally owing to him, that the Stadtholderate had been conferred on the latter. He admitted that he had suspected the Prince of designs hostile to the constitution of the United Provinces, and had opposed the Prince in every measure, which appeared to have such a tendency; but he asserted that he never had resorted to means which the laws or constitution of the Provinces did not warrant. His arguments were unanswerable; but Prince Maurice was determined on his ruin; and the Commissioners were wholly subservient to the prince's views: they accordingly passed unanimously a sentence of death upon Barneveldt. Many of the princes of Europe expressed their dissatisfaction at these proceedings: none so much as the French monarch. To him, the great merit of Barneveldt had been long known. He considered that the conduct of Prince Maurice was likely to involve the United Provinces in troubles, of which Spain might take advantages. From personal regard to Barneveldt, and with a view of terminating the discord, the monarch sent an ambassador extraordinary to the United States, and ordered him to join Du Maurier, his ambassador in ordinary, in soliciting them in favour of the accused, and in labouring to restore the public tranquillity. The ambassadors executed their commission with the greatest zeal. They made many remonstrances, and had several audiences both with the States and the Prince. The States, instigated by the Prince, expressed great indignation at the proceedings of the ambassadors. All the accused were respectably allied, and had many friends: numerous applications were made in their favour. They undeviatingly demeaned themselves with the firmness and modest dignity of conscious innocence. They persisted in denying the guilt attributed to them, and in protesting against the competency of the tribunal. They made no degrading submission. At a subsequent time, a son of Barneveldt having been condemned to death, his mother applied to Prince Maurice, for his pardon. The Prince observed to her, that she had made no such application in behalf of her husband; "No," she replied, "I know my son is guilty, I therefore solicit his pardon; I knew my husband was innocent, I therefore solicited no pardon for him." On Monday morning, May 13, 1619, Barneveldt was informed that he was to be executed upon that day. He received the notification of it with great firmness; he inquired whether Grotius and Hoogerbetz were to suffer: being answered in the negative, he expressed much satisfaction, observing that "they were of an age to be still able to serve the republic." "The scaffold for his execution was erected in the Court of the Castle at the Hague, facing the Prince of Orange's apartments. He made a short speech to the people, which is yet preserved in the Mercure Fran�oise. 'Burghers!' he said, 'I have been always your faithful countryman; believe not that I die for treason: I die for maintaining the rights and liberties of my country!' After this speech, the executioner struck off his head at one blow. It is affirmed that the Prince of Orange, to feast himself with the cruel pleasure of seeing his enemy perish, beheld the execution with a glass; the people looked on it with other eyes: many came to gather the sand wet with his blood, to keep it carefully in phials; and the crowd of those, who had the same curiosity, continued next day, notwithstanding all they could do to hinder them. "Thus fell that great minister, who did the United Provinces as much service in the cabinet, as the Prince of Orange did in the field. It is highly probable that the melancholy end of this illustrious and unfortunate man was owing to his steadiness in opposing the design of making Prince Maurice Dictator." The Prince pursued his triumph. Soon after the arrest of Grotius, the States of Holland presented a petition to the Prince, representing the arrest as a breach of their constitutional rights; the Prince referred it to the States General. To these, therefore, they presented a similar petition; praying at the same time, that Grotius might be tried by the laws and usages of the Provinces of Holland: no regard was shewn to their petitions. Grotius had an invaluable friend: - he was no sooner arrested, than his wife petitioned to share his confinement throughout the whole of his imprisonment: it was denied. Grotius fell ill: she renewed the application: it was absolutely rejected: but neither his wife, nor any of the friends of Grotius ever recommended to him an unworthy submission. He always denied the competency of the tribunal appointed to try him: his wife and brother uniformly recommended him to persist in his plea. Much disregard of form took place, and many arbitrary acts were perpetrated, in the proceedings against Grotius. On the 18th of May 1619, the Commissioners pronounced sentence against him. After enumerating all the charges, of which he was accused, and asserting that all were proved against him, the judges condemned him to perpetual imprisonment, and his estates to be confiscated. The same sentence was passed on Hoogerbetz; but the house of the latter was assigned to him for his imprisonment. On the 6th of June, Grotius was taken to Louvestein. It lies near Gorkum, in South Holland, at the point of the island formed by the Vaal and the Meuse. Twenty-four sous a day were allowed for his maintenance; but his wife undertook to support him, during his confinement, from her own estate. She was at length admitted into prison with him, on condition that she should remain in it, while his imprisonment lasted. At first, his confinement was very rigid: by degrees it was relaxed: his wife was allowed to leave the prison for a few hours, twice in every week. He was permitted to borrow books, and to correspond, except on politics, with his friends. He beguiled the tedious hours of confinement by study, relieving his mind by varying its objects. Antient and modern literature equally engaged his attention: Sundays he wholly dedicated to prayer and the study of theology. Twenty months of imprisonment thus passed away. His wife now began to devise projects for his liberty. She had observed that he was not so strictly watched as at first; that the guards, who examined the chest used for the conveyance of his books and linen, being accustomed to see nothing in it but books and linen, began to examine them loosely: at length, they permitted the chest to pass without any examination. Upon this, she formed her project for her husband's release. She began to carry it into execution by cultivating an intimacy with the wife of the commandant of Gorkum. To her, she lamented Grotius's immoderate application to study; she informed her that it had made him seriously ill; and that, in consequence of his illness, she had resolved to take all his books from him, and restore them to their owners. She circulated every where the account of his illness, and finally declared that it had confined him to his bed. In the mean time, the chest was accommodated to her purpose; and particularly, some holes were bored in it, to let in air. Her maid and the valet of Grotius were entrusted with the secret. The chest was conveyed to Grotius's apartment. She then revealed her project to him, and, after much entreaty, prevailed on him to get into the chest, and leave her in the prison. The books, which Grotius borrowed, were usually sent to Gorkum; and the chest, which contained them, passed in a boat, from the prison at Louvestein, to that town. Big with the fate of Grotius, the chest, as soon as he was enclosed in it, was moved into the boat. One of the soldiers, observing that it was uncommonly heavy, insisted on its being opened, and its contents examined; but, by the address of the maid, his scruples were removed, and the chest was lodged in the boat. The passage from Louvestein to Gorkum took a considerable time. The length of the chest did not exceed three feet and a half. At length, it reached Gorkum: it was intended that it should be deposited at the house of David Bazelaer, an Arminian friend of Grotius, who resided at Gorkum. But, when the boat reached the shore, a difficulty arose, how the chest was to be conveyed from the spot, upon which it was to be landed, to Bazelaer's house. This difficulty was removed by the maid's presence of mind; she told the bystanders, that the chest contained glass, and that it must be moved with particular care. Two chairmen were soon found, and they carefully moved it on a horse-chair to the appointed place. Bazelaer sent away his servants on different errands, opened the chest, and received his friend with open arms. Grotius declared, that while he was in the chest, he had felt much anxiety, but had suffered no other inconvenience. Having dressed himself as a mason, with a rule and trowel, he went, through the back door of Bazelaer's house, accompanied by his maid, along the marketplace, to a boat engaged for the purpose. It conveyed them to Vervie in Brabant: there, he was safe. His maid then left him, and, returning to his wife, communicated to her the agreeable information of the success of the enterprise. As soon as Grotius's wife ascertained that he was in perfect safety, she informed the guards of his escape: these communicated the intelligence to the governor. He put her into close confinement; but in a few days, an order of the States General set her at liberty, and permitted her to carry with her every thing at Louvestein, which belonged to her. It is impossible to think without pleasure of the meeting of Grotius and his heroic wife. From Vervie he proceeded to Antwerp; a few days after his arrival in that city, he addressed a letter to the States General: he assured them, that, in procuring his liberty, he had used neither violence nor corruption. He solemnly protested that his public conduct had been blameless, and that the persecution he had suffered would never lessen his attachment to his country. 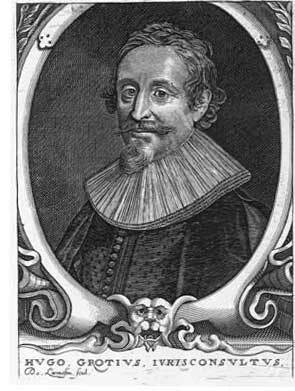 It was on the 22d March 1621, that Grotius obtained his liberty. In the same year, the truce, concluded for twelve years between Spain and the United Provinces expired: it was expected, that the war would be resumed with more fury than ever. But this did not happen; the war of thirty years, which we shall afterwards have occasion to mention, had mixed the contest between Spain and the United Provinces with the general military plans and operations of the parties engaged in it, and had carried much of the conflict from the Low Countries into Germany. Prince Maurice still appeared at the head of the army of the United Provinces; but he had lost, by his persecution of the Arminians, and his selfish intrigues, the confidence of the people. Conspiracies against his life were formed: fortune no longer favoured his arms. His attempts to compel the Marquis Spinola to raise the siege of Breda were unsuccessful. This reverse of fortune preyed upon his mind. He thought himself haunted by a spectre of Barneveldt: he was frequently heard, during his last illness, to exclaim, "Remove this head from me!" "This anecdote," says the author of the Resum� de l'histoire de la Hollande, "is related by all the republican historians of the United Provinces; it is concealed by the flatterers of the House of Orange.... To relate the remorse of princes for their crimes, is one of the most useful duties of historians." Prince Maurice died in 1625.